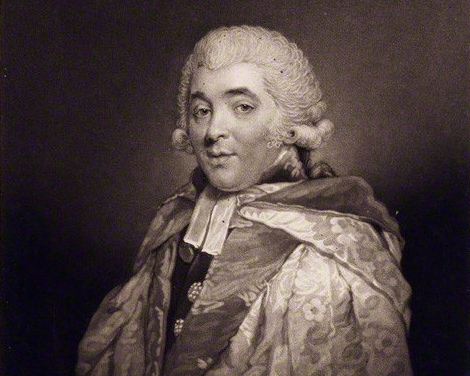 Thomas Sanders Dupuis (1733 – 1796) was Organist and Composer to King George III, highly regarded as a performer, and best known today for a set of organ voluntaries published after his death. He was right at the centre of British musical life in the late 18th century and a close friend of many who had known and worked with G F Handel. Born 5th November, 1733, Thomas Sanders Dupuis was the son of a French Huguenot emigrant, John Dupuis, who may have had a minor position in the Royal Court or at least the patronage of influential people such as Charles Butler, 1st Earl of Arran (1671 – 1758), who had been a Lord of the Bedchamber to William III, a lieutenant-general, and was Chancellor of Oxford University from 1715 until his death. In any case, John was able to secure for Thomas a position as a boy chorister in the Chapel Royal under Bernard Gates and John Travers. Gates was a well-known associate of Handel and it was at Gates’ house that Handel conducted the first (private) performance of his oratorio Esther. Little is known of Thomas’ early adult life. He became a member of the Royal Society of Musicians in 1758, and his name crops up in adverts for concerts, such as a performance on the organ he gave in January 1761 at the Great Room in Dean Street, Soho. It seems that he lived all his life at the house in King’s Row off Park Lane which his father had leased. His mother had died when Thomas was very young and he was brought up by a stepmother, Susanna (nee Hadnock) his father had married when he was aged two. His father died in 1757 and his stepmother in 1786. In 1763, Thomas is listed in King’s Row as a harpsichord teacher. In 1765, at nearby St George’s Church, Hannover Square, he married Martha Skelton, of Fulham. She may have been a relative of the Thomas Skelton who was also a Chapel Royal chorister and who had sung at the musically significant 1727 Coronation of George II, for which Handel had written anthems such as Zadok the Priest. Around the late 1760s, Thomas became organist of the Charlotte Chapel, in Charlotte Street, Pimlico, a daughter Church of St George’s, Hannover Square. He was probably appointed by the notorious Dr William Dodd, a clergyman, who became the last person in Britain to be hanged for forgery. Dodd had won £1,000 in a lottery and used the proceeds to help build the chapel in 1767, so Thomas may have been the first organist. He was certainly in post by 1773. Dodd was handsome and a great preacher, and attracted a fashionable crowd, including George III’s consort, Queen Charlotte, after whom the chapel was named, and who rented four capacious pews for her household. She would certainly have aware of Thomas’ abilities on the organ. Thomas remained at Charlotte Street after Dodd’s fall from grace and execution until, in 1779, he was appointed one of the two Organists and Composers of the Chapel Royal, replacing William Boyce who had died, and sharing the duties first with James Nares (1715 – 1783), then with his good friend Samuel Arnold (1740 – 1802), who replaced Nares in 1783. Thomas Dupuis and Samuel Arnold were largely instrumental in keeping alive the fellowship among the former and current gentlemen and boys of the Chapel Royal, organising an annual feast at the Crown and Anchor in The Strand, at which new compositions would be performed, and visiting the legendary Handel singer, John Beard (a former Chapel Royal chorister) and Thomas’s old mentor, Bernard Gates, keeping them in touch with all the musical gossip. When Gates died, he left Thomas an estate in Warwickshire with the proviso that should Thomas die without heirs it should then pass to Samuel Arnold. Unfortunately for Arnold, Thomas had three children, two of which were still living when he died. Thomas was one of the organisers of the great Handel Commemoration in Westminster Abbey in 1784 which marked the 25th anniversary of his death, and the following year he arranged a 70th birthday party for John Beard at the Crown and Anchor. In 1790, Oxford University conferred on him an honorary Doctorate of Music (the portrait of Thomas in the video above shows him in his Oxford doctoral robes), and in 1792, Haydn, on a visit to London, was highly impressed when he heard Thomas playing the organ at the Chapel Royal. But the last years of his life also saw both the loss of his wife and that of his eldest son, Thomas Skelton Dupuis. On Sunday, the 10th July, 1796, despite being severely ill, he insisted on carrying out his duties at the Chapel Royal in St James’s Palace, but this proved fatal. He died early in the morning the following Sunday at his house in King’s Row at the age of 62. The immediate cause was attributed to an overdose of opium. Although he had specifically asked to be buried with his wife in Fulham, his wishes were disregarded and he was buried in Westminster Abbey.